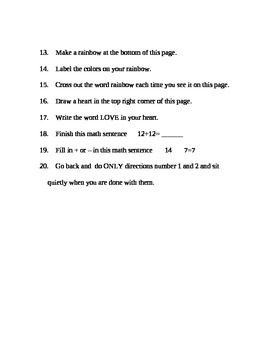 You can use this "test" to see how well your students follow directions. 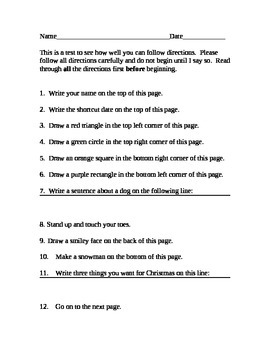 The students are directed to read all of the steps PRIOR to starting/doing anything. At the end, the last direction says: "Go back and do ONLY directions number 1 and 2 and sit quietly when you are done with them." Some of the directions in between are meant to be silly so that you can see who is NOT following directions. When you are finished with the "test", use it as a "teachable moment" where you can point out how important it is to read ALL directions and follow them carefully.